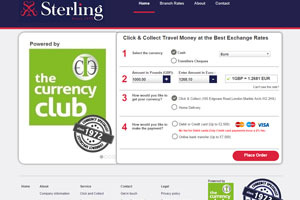 Easy to use web site and currency arrived as expected. Have used many times always good and on time will use again highly recommend. Used Sterling numerous times and they do what it says on the tin - competitive and efficient. One note of disappointment is the service charge for using my debit card to pay - i thought this was now outlawed. Everything went smoothly .A bit apprehensive as never used a postal service before.Only 4* as I asked for mixed notes but most were the highest value note Hungary uses ! Would use again but would expect smaller value notes. Used sterling 4 times excellent service delivery on time would recommend sterling every time. Very quick. The currency I ordered arrived, the next day, quicker than the money left my account... Outstanding. Ordered a mixture of notes, got all the same! Very reliable and very quick delivery. Unsure at first about ordering online currency, but I needn't have worried at all! The process was easy, and the delivery very fast. I shall be ordering again soon. Second time ive used these to change money. Excellent rates and an amazing service. Would highly recommend. Another great experience with Sterling. Good exchange rate and prompt next day signed delivery by Royal Mail. The transaction was easy and secure being able to use my debit card was a plus. The exchange was the best around. Rate was 8.5 yuan to the pound the best on the High Street was 8.25 but was not guaranteed as the money had to be order in so the rate could be anything. The delivery was with royal mail special delivery before 1am I went to the delivery office to pick it up at 0730 So I didn't miss the postman. Currency arrived on time, excellent service. The rate of exchange was excellent compared to those offered by the better known banks,post office etc.and the money arrived promptly on the specified date. A great exchange rate, easy to order on line and the currency came on time. Simple, effective and great service. What more could anyone want? Everything was exactly as expected. No nonsense and no fuss.